parts-partner has no other items for sale. - Computer Parts Ltd - 20 Woodside Industrial Park, Letchworth Herts. SG6 1LA - All Equipment is owned by Computer Parts Ltd until the items have been paid in Full. - All equipment will be tested unless stated in the sales details. - Items can be returned within 14 days of receiving the equipment from itemns that have been purchased on Ebay unless stated in the sales details. - The buyer must pay for the postage of the returned item. - All new sealed equipment must be returned unopened. - Faulty items can be returned within 14 days of receiving the equipment unless stated in the sales details. - The postage will be refunded to the buyer once the item has been confirmed faulty by us. - All serial numbers will be checked on any returns. The serial number will be printed on the invoice. Immediate payment of £124.00 is required. Does exactly what it is intended to do. The set up is a bit fiddly, so would not say it's exactly "easy" but it's not difficult either -- I'd say it depends on your experience with setting up hardware or even thermal printers. Because there are no ink cartridges to mess with/pay for, once set up is complete you're pretty much good to go and your biggest expense moving forward is labels. 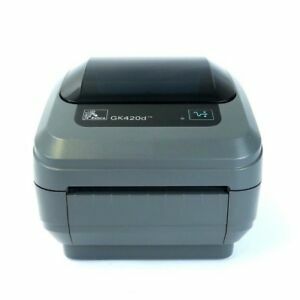 If you're doing any volume of business requiring shipping labels this printer will pay for itself quickly by saving on ink, paper, and, perhaps most important of all, time. I am quite annoyed that I haven't discovered this brilliant printer earlier. It's quite simply amazing. Brilliant quality prints Easy to setup No ink required Prints fast It's a great little tool for small business owners. Wish I discovered it earlier. Life would have been so much easier. Since it was used, it was a little hard to find software to go with the program, but thankfully I found some. It was quite easy to set up and it works great. As good as a new one. Works perfectly. THe printer is noisy, but I expect that's the brand not the refurbishment. Fast little printer at a better price than a brand new one.